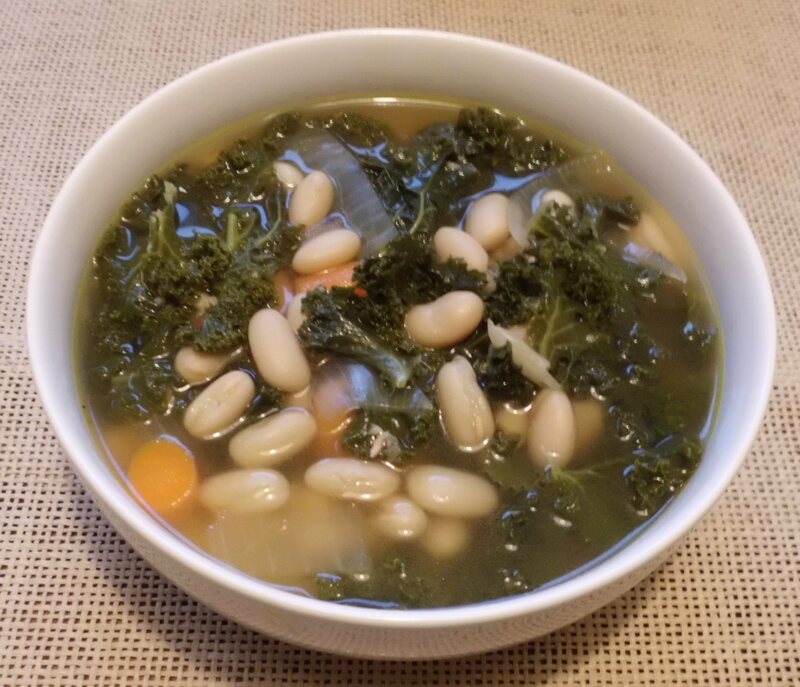 I’ve been hearing about kale, kale, KALE, and on a recent, cold “winter” day (it’s been unusually warm this winter but some of the days have been pretty cold), I decided to make Kale and White Bean Soup. This is another “throw it all into the pot and eat it with a chunk of bread” kind of meal, and sounds more prissy than it actually it. 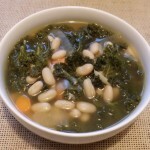 I used beautiful fresh kale, about a pound, and you can eat the soup “as is,” or add one of the ingredients with an asterisk. I added chili flakes, but I can imagine how yummy it would have been with a splash of lemon or sherry! Vegetable Broth- approx. 3 or 4 qts. Add white beans and kale. Don’t take the time to trim the stem of the kale out of each piece. Too time consuming. Hold the end of the rib, pull the leafy part off of the rib, and drop it into the soup. Discard the rib. Once the kale is wilted, season the soup with salt and pepper, remove bay leaf, and add one of the extras, if using. Also, if you’d like a deeper veg flavor in the broth add a veg bouillon cube or two. This soup is a keeper. Wanna bet I take the container I set aside out of the freezer and eat it tomorrow! By the way, this is perfect with my “One Hour Bread.” A bowl of soup and a chunk of fresh bread. Heaven! Thank you for this recipe and the post on LinkedIn! I have bok choy galore in my garden and substituted it for the kale in this recipe. It’s yummy! Its always great to hear that someone enjoyed a recipe and the bok choy sounds like an interesting idea. You might want to try the kale next time, for its iron benefits…. and you don’t have to chop it! Thanks so much!